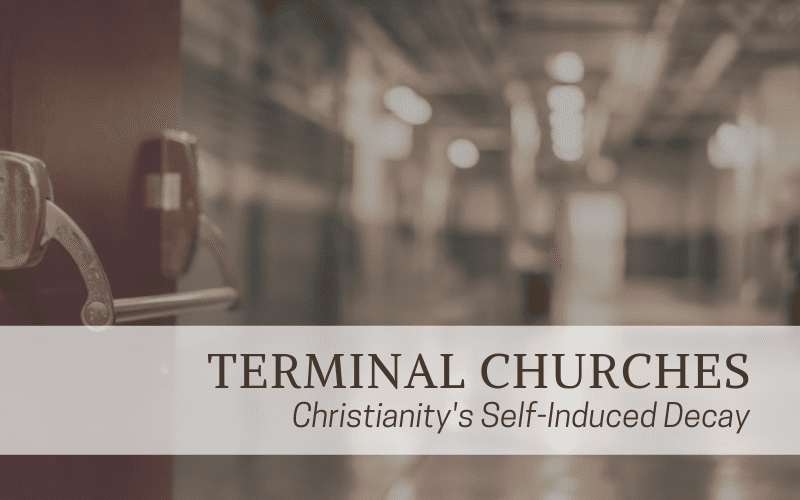 What is a terminal church? I mean terminal in two senses. The modern institutional church sees itself as the end of Christian life and activity, and also the contemporary institutional church is on its way to death. How has this happened? First, the church sees itself as the end-all-be-all, if not explicitly then implicitly. It calls all ministries to be within their walls, under their “care,” and not to be pursued until the church leaders have given their stamp of approval. The church has absorbed more and more pre-eminence in regards to becoming the dispenser of evangelism, discipleship, outreach, etc. Let’s look at a few examples. Those who serve “in the church” receive the accolades and public recognition in local churches. Additionally, those who did extra-ministries on church premises, or off the premises but under the banner of the local gathering, are the center of public recognition. You will not hear, at least anywhere near as often, about the man who started a business and is employing and discipling poor migrant workers. Or about the consultant who trains businesses (owners and employees) to communicate better and is creating more efficient systems that benefit those inside and outside the company. Ronald Kirk points this out in his excellent book, Thy Will Be Done. First, successful industry and business produce material wealth that blesses all those around us…Second, businessmen who self-consciously apply God’s Word to their work should produce superior products, the historic pattern among God-fearing people (e.g . , Deuteronomy 28:1–4)…Third, successful enterprise builds capital for philanthropic, missionary, educational, and other Great Commission work. Fourth, marketplace relationships discipline men to love one another and become more civilized. Kirk, Ronald W. Thy Will Be Done: When All Nations Call God Blessed (Kindle Locations 1699-1707). Furthermore, the terminal church harms the education of children through the excessive and sole promotion of children’s ministries. They “teach” Christian children in Sunday school but do nothing to train the parents in how to train their children in righteousness. As a result, children are given a somewhat-Christian education once a week. While government-sponsored “theology” is forced on them five days a week. Instead of training parents to disciple their children in the home seven days a week, the terminal-church teaches an “adult sermon,” ships the kids off to a sermon that lacks little to no training in self-government under God, and then the people go home. The main tactic through all of these examples is to multiply “ministries” that the local church offers. Youth, young adult, young married, “senior saints,” potential leaders, singles, and a whole host of other groups have various events, studies, etc., that are all coopted under the banner of the local church. From this point on, it is easy to bring the complete religious life of individual Christians into the institution. Second, bemoan the fact that so many in the Church have lost a sense of hope and community. Then, present these ministries as the solution. Third, put up signup sheets for these groups in prominent areas, making public those who have signed up while also identifying those who have not. Fourth, use every announcement opportunity afforded by the liturgy or service to bring up the benefits of these functions as well as the opportunity to love one another … again. And again and again. Fifth, bemoan the lack of love for the saints and emphasize today’s “cold-hearted Christianity” by hinting at the open spaces still left on the signup sheets. the equipping of the saints for ministry throughout their whole life, outside the local assembly, for the growth of the Kingdom of God. The institutional church does not exist to peddle services (what we now call ministries) as socialistic civil government does. Christians do not exist to serve the institution of the church, but rather the church to serve believers. The church is not more holy than other institutions, as all institutions ought to be holy, though the church certainly represents a particularly rich, unique, and critical place among the godly institutions. Rather than diminishing the church, limiting the church to its proper authority should exalt it without spiritually diminishing other areas of life. Kirk, Ronald W.. Thy Will Be Done: When All Nations Call God Blessed (Kindle Locations 1426-1431). The authoritative Church will be restored as a teacher of righteousness, even to the rulers of nations, once the institutional church returns to its limited and God-ordained function. Was the institutional church meant to be terminal? Was the Church to be subsumed into the institutional church? Nope. The people of God were never meant to be a centralized bureaucracy. Most Laws in the Bible were not punishable by the civil government. In fact, only a few visits to Jerusalem were required a year. The Levites who took care of social services (health, education, etc.) were available throughout the land of Israel. What we see is that the Church was chiefly decentralized. The training of such mature men is the function of the church. The purpose of the church should not be to bring men into subjection to the church, but rather to train them into a royal priesthood capable of bringing the world into subjection to Christ the King. The church is the recruiting station, the training field, and the armory for Christ’s army of royal priests. It is a functional, not a terminal, institution. The church has by and large paid lip service to the priesthood of all believers, because its hierarchy has distrusted the implications of the doctrine, and because it has seen the church as an end in itself, not as an instrument. Rushdoony, RJ, “Institutes of Biblical Law” Volume 1, pp. 850. What is the local church, as an institution, supposed to look like? What is its ministry? And finally, what is the duty of its leaders and the saints under them? The institutional church is not meant to be terminal. The ministry of the Church is not to be limited to the walls of churches. What is the goal of local church leaders? There are five types of leaders named in the passage: apostles, prophets, evangelists, shepherds, and teachers. Some have merged the last two on the list into the same position. Others claim that the prophet role no longer exists. And still, others believe that they are men gifted by the Holy Spirit to this day. While I agree with the latter position, that is not the point to this post. We are more concerned with what these gifts to the Church were supposed to accomplish. The pastor is a teacher, and normally and historically in many communions, he is not even a member of the congregation he serves. The government of the congregation is in the hands of the laymen. The pastor is simply brought in as a teacher who is to instruct the laymen in what their calling and duty is. If the congregation does not know how to discipline and educate their children, manage their business and financial affairs according to God’s Law, and handle societal challenges in their context, then that institutional church is a failure. As soon as we have abandoned this primary goal and function of the leaders in the institutional church – the training of the laymen for all-of-life ministry – we have abandoned the blueprint for advancing the Kingdom. We often talk about a “call to the ministry,” or “going into full-time ministry.” The idea is that someone goes into “church work” as their profession whether a pastor, teacher, evangelist, etc. The main problem is that it goes against the grain of our text above for who is doing the ministry – the layperson or congregants. Have you ever heard any of the following? I preach to the simple. When I preach, I consider the person with the least amount of knowledge. Simple messages are obtainable by more people on Sunday morning. You could probably list a few variations yourself. Basically, these all mean that Sunday morning sermons are tailored to the least common denominator. Whatever is the least amount of knowledge held by someone, that is what I aim for in a message. This type of preaching and teaching leads to two things: stagnation and fruitlessness. The common denominator will stay the common denominator, which in this case is the lowest. This type of ministry also results in division. When people are not trained in weighty theological truths and the practical application of them, basic theological divisions can grow and fester. Also, the determining factor between obedient and non-obedient Christians shifts to the realm of preference. We’ve seen it too often – not liking or avoiding people for the way they present themselves (dress, hairstyles, facial hair, etc. ); eating habits (eating with fingers, chews with mouth open, makes loud sounds, doesn’t eat healthily, eats too healthy, etc. ); occupation; interests; etc. All the while, the weightier matter of the laws are ignored and broken. Basically, the “teaching to the simple” ministry paradigm is a revolt against maturity. What is the job of the saints? Now, this means that the church must be in the real world, and we can best understand the work of the laymen in the church if we see laymen as a chaplaincy into the world at large. The real world out there is where the church belongs. A layman does not leave the church when he walks out of the building. He is a part of the church, and he must carry Christ into his vocation, into his family, into every aspect of his life. So the role of the layman in the church is as a chaplaincy to the world…To go out and to establish godly principles of life in their homes, in their callings, in every area of life. In politics, economics, agriculture, the sciences, everything. The congregants are those who go out and bring the ministry of Christ to bear on the culture. If the church is the armory of God, then the laymen are God’s chaplains. What are the blessings of obedience to Ephesians 4? and be shaped after the fulness of Jesus Christ. A training church and its leaders will work to train laymen for ministry. In a sense, they will “work themselves out of a job.” Being a leader like this takes humility. In order to prevent a terminal church, you must see yourself as having a terminus; that you are replaceable, and that those you train will be better than you. Train parents in the Biblical presuppositions of education – how they can train their children themselves via homeschool, or how to pick someone to delegate their educational responsibility to. Teach not only how to exegete Scripture, but also how to apply the doctrine therein. Not peddle hundreds of “ministries” which will own the time of the saints and keep them from doing “ministry” as the chaplains of God. Encourage saints to host and start their own ministries outside of the local church and will be ready to give advice and counsel when needed. More suggestions for a training church can be gleaned from a previous article on alternatives to seminary. If we are to gain back any relevance we have lost over the last century or so, then we must not hide our “light” and horde our salt inside the institutional church. Or depend upon it, our churches will die.